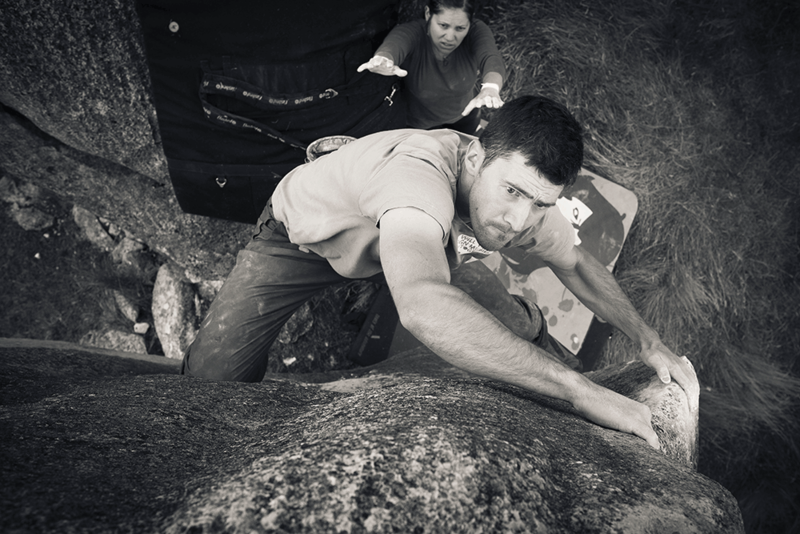 This article first appeared in The Climber issue 87. 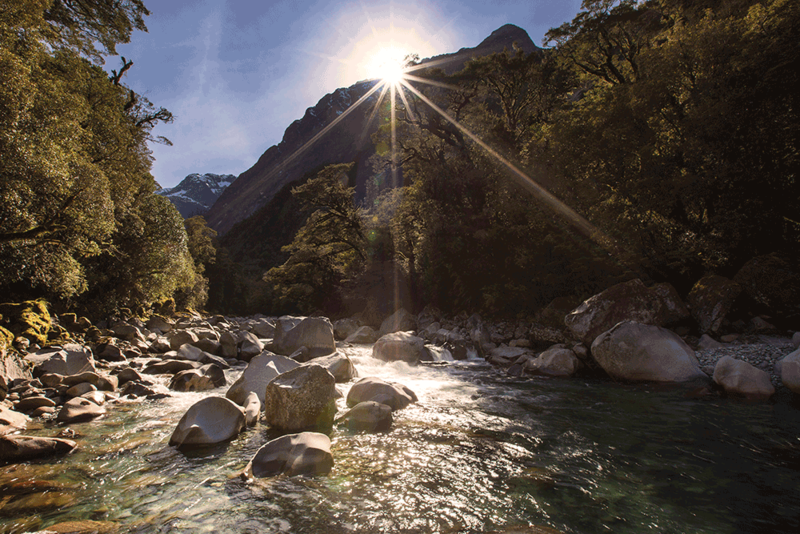 Email us at office@alpineclub.org.nz to purchase a copy. The very act of going climbing puts us in some unique places and enables us to experience some sublime and sometimes daunting moments. Photography allows us to capture something of these places and sensations, whether it’s an alpine climb or a trip to the crag. Your decision to pull out your camera is usually dictated by your emotional response to your circumstances—those ‘look at that!’ moments at dawn, high on a mountain, or when your mate is way above the pads, sending an improbably high boulder problem. These tips are designed to help you get the most out of those moments and make a photo, rather than take one. Climbing is an action sport and with rock climbing in particular, things can happen fast. Use the following method to freeze climbing action: If your camera has a shutter priority mode (TV on Canon, S on Nikon) use this to set a shutter speed of 1/500th second or faster. In shutter priority mode the camera picks an aperture that will maintain a correct exposure, based on the camera’s metering. Focus on the area you want in critical focus (say, the climber’s face, or where you predict it will be) and take a test shot to check your exposure histogram (see tip 5: Reading a Histogram). If the exposure is off, use your exposure compensation to adjust it in one-third-stop increments. Using burst mode is valuable for getting the money shot—when the subject’s expression is right, their eyes aren’t closed and their hand is in exactly the right place. This method works well when you’re above the climber, looking down on them. Alternatively, you might want to illustrate the movement of climbing by blurring it (motion blur). Using the same camera mode, pick a shutter speed around 1/30th second or slower, remembering that it still needs to match focal length, and fire the shutter when your subject is in motion (see tip 2: Sharp Shooter). How sharp your photo is comes down to three things: a sufficiently fast shutter speed for the focal length, shooting from a stable platform (be it yourself or a tripod), and sufficient depth of field. 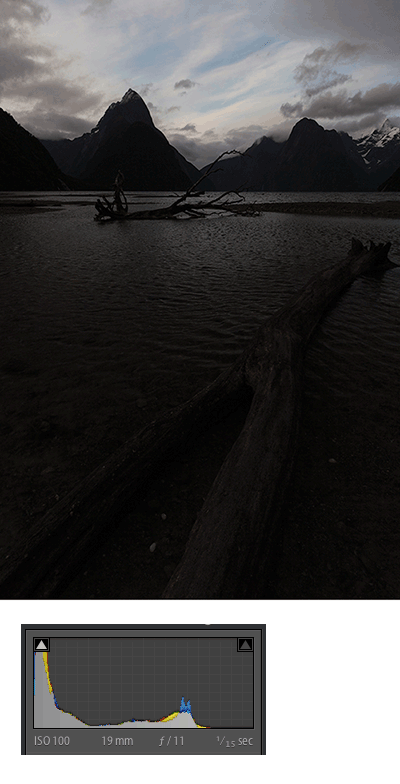 For an epic landscape shot you need to align all three. The rule of thumb for shutter speed is that it should at least match the focal length you’re shooting at, so if your focal length is 50mm, your shutter speed should be at least 1/50th second. Above 70mm I tend to at least double the shutter speed to allow for heavier lenses and subjects that are further away. Thinking of yourself as a human tripod will help minimise camera shake. It’s akin to aiming a rifle—your stance should be locked, elbows tucked to chest, your body still and your left hand firmly cradling the bottom of the lens. Shoot like you mean it! If you’re shooting at marginal shutter speeds (less than your focal length) without a tripod, brace against a tree or boulder. Even with fast shutter speeds, your shots will be better if your camera is stationary. Tripod-use comes down to two main scenarios: when the light’s simply too low to shoot handheld with reasonable shutter speeds and ISOs, or when you deliberately want to capture motion, such as a river or cloud movement. In the case of the former, why not just increase the ISO? With higher ISOs comes greater electronic interference, or noise, which appears in your shots as coloured speckles in the dark areas and a reduced colour range. In mid-range cameras, ISO noise starts to become more visible about 400 ISO and is worse in low light. Generally I try to keep my ISO below 400, and only push it higher than that if I’m really forced to by the subject and moment. So if you’re in a low light situation and you want to keep your ISO low and your aperture stopped down (closed) enough for ample depth of field, your shutter speed’s going to get pretty slow, hence the need for a tripod. I recommend using mirror lock-up or live preview mode for anything slower than about 1/50th second on a tripod—it will reduce vibration. Using a cable release or a two-second delay shutter release will reduce vibration further. Finally, keep an eye on your aperture when framing up scenes. Even with wide-angle lenses (which tend to have greater depth of field (DOF)) if you want your scene to be tack-sharp, apertures in the f8–f11 range will give the best DOF/sharpness combination. 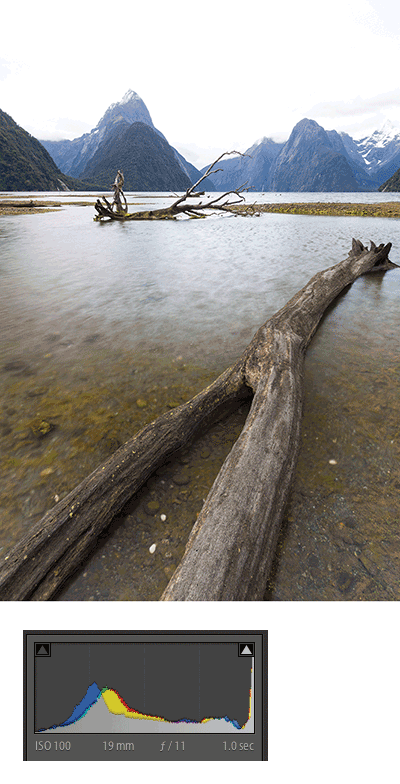 If you focus about one third of the way into the scene you will have excellent front-to-back sharpness at f11. While, say, f20 theoretically gives even greater DOF, lenses start to diffract light when stopped down that far and soften the image overall. Viewing photography in books, galleries and perhaps this very magazine, you’ll have noticed that there are images that—irrespective of subject and moment—just ‘work’. The reason they work is due to composition and the photographer finding synergy or relationships between the elements in the picture. The most common basic framework for composition is the rule of thirds, whereby crucial subject matter is placed on the intersecting lines of an imaginary nine-rectangle grid laid over the top of your scene (see figures below). For reasons of balance, space and tension, using this formula invariably leads to an image that will sit comfortably with the viewer and invite them in, encouraging the eye to explore the image . The rule of thirds works equally well in action shots and landscape photography, but it’s important to remember that it’s just a guideline. Ultimately, whether a composition is successful or not comes down to it having some sort of structure, and the basis for that structure comes from experience and the photographer’s imagination. If the subject matter is right for it, centred compositions can be very powerful, but you might also structure your photo around scale, depth or contrast. Every time I look through the viewfinder I make decisions about what to leave in and what to leave out, and I scan every part of the scene to analyse how the elements might work together. A final step before hitting the shutter is to inspect the edges of your frame for extraneous details that might detract from your image. Small differences in the photographer’s position, such as a step to the left or right, can make a big difference to the scene in your viewfinder and take an image from mediocre to magnificent. Remember, you’re designing your photo. Bring what you want to it. 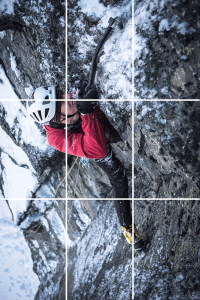 Putting the effort into getting an interesting angle is often what makes climbing photos stand out, and invariably shots taken on abseil or from an opposite cliff or high point allow the action to be captured best. Think about the architecture of the rock and how you can capture that and the climber together in way that gives your image unity. Rapping in (or jumaring up) on a rope fixed to a nearby anchor gives a useful off-to-the-side angle and keeps you out of the climber’s way. Just remember to check where the light is falling so that your shadow is not cast over the climber. Watch out for the climber’s face being hidden by their own shadow too. A Grigri and a single ascender with a foot loop makes the best photography set-up because it’s very quick to switch to descending mode. As with any photographic situation, anticipation is crucial. Suss out where the action’s going to happen and think about where the climber’s body is going to face most of the time. Many a good climbing shot has been ruined by the climber’s face being hidden. Body position makes or breaks climbing photos too, so watch for those moments where the climber’s position creates tension in the scene or indicates physicality. 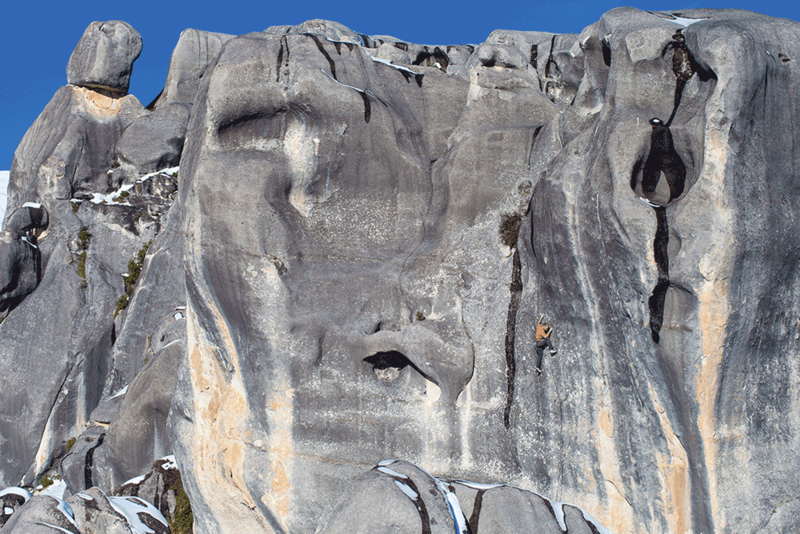 Creating a sense of scale is another formula for great climbing photography. 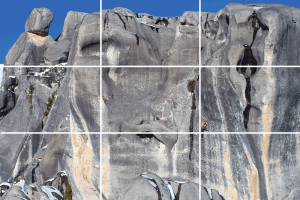 Get further away from the crag and compose your scene as you would for a landscape photo (apply the rule of thirds and look for lead-in lines, balance, repetition or depth) and then place the climber within that scene. No matter how good your composition, if your photo is under- or over-exposed it’s not going to be a winner. Exposure recovery has reasonable latitude if you are shooting RAW images, but if you’ve shot a JPEG, as most casual photographers do, it’s tough to make a bad exposure look presentable. One of the greatest advantages of digital photography is the ease of viewing instant data about the technical quaility of your exposure; this comes in the form of the histogram. Many photographers glance at their preview image to gauge how good their exposure is, but this is an inaccurate way of telling what’s actually happening in your photo. Preview images are usually artificially bright, especially so in low light, meaning that the user thinks the photo is more brightly exposed than it actually is. Learning to read a histogram (and habitually viewing it) will not only help your exposures in the field, but also your processing ability. A histogram is simply a graph of pixel brightness, with the darkest pixels (blacks, or shadows) at the left, midtones in the centre, and whites (highlights) on the right. The greater the presence of a certain brightness in the scene, the taller the graph will be. While the profile of a histogram can vary depending on the type and quantity of light in a scene, the key thing to avoid is ‘clipping’. Clipping occurs when an image is under- or over-exposed, and is visible in your histogram as columns stacked at the left (underexposed) or right (overexposed) sides of the graph (see figures at left). This will manifest itself in your photo, respectively, as: under exposure and shadow areas that have no visible or recoverable details (too many pixels that are 100 per cent black) and overexposure, or ‘burned’ highlights where there is no detail (too many pixels that are 100 per cent white). From a purely technical perspective, the ultimate exposure is one where the data in the histogram represents a bell curve, nearly touching down to the bottom of the graph at either end (see figure below). When I make a new exposure, I’ll check the histogram straight away and then if necessary make a correction for my next exposure using the exposure compensation adjustment. Whether you’ve shot RAW or JPEG, digital images always require a little tweaking for them to look their best straight out of the camera, so if you’re not using in-camera presets to style your photos (and I don’t recommend you do), it’s worth applying a little bit of sharpening, contrast adjustment and some subtle saturation adjustments. If your composition was slighly off, a crop can go a long way towards making an image better too. Remember that less is more when it comes to processing and over-saturation—black shadows with no detail or burned out skies from overdoing contrast adjustments are photo-killers. Try to keep your processing subtle and remember that it’s about enhancing what’s already awesome about the shot, not rescuing a shot that’s mediocre anyway. It’s best to get your shot as perfect as possible in-camera—exposure and composition-wise—and then emphasise as necessary in post-processing. For processing photos I recommend Adobe Lightroom (PC/MAC) or Aperture (Mac-only). These powerful applications allow fine processing of every detail of your photo, while proving peerless editing and cataloguing functions all in one programme. If you’re half serious about photography, I strongly recommend shooting in RAW format. While it means more processing time at the computer and learning a little more, it opens digital photography up considerably and gives you more creative input and control over your final image. RAW is simply the digital equivalent of a negative (except that it’s already positive!) and gives amazing latitude in processing. Images that are under- or over-exposed can be recovered to look perfectly usable. 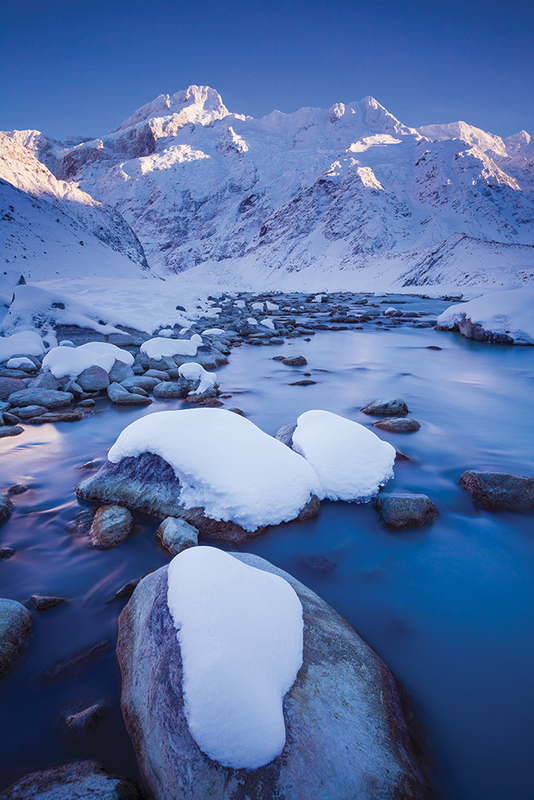 RAW allows you to adjust contrast, colour emphasis and temperature and sharpness to suit. Rich black and white conversions are possible, and the beauty of working with RAW is that as you learn more you can return to previously processed photos and rework them. An option for those unsure about making the commitment to RAW is to shoot RAW+JPEG (a setting possible in most decent cameras), that way the JPEGs are available for a quick upload to social media while you craft works of art with the best RAW versions. In the days of film, it was correctly said that if you wanted to upgrade camera kit, you were best spending your money on lenses. After all, the camera body was simply a box for holding and exposing film and it was the quality of the glass that created richer photographs. While this is still true for lens glass, there is a big difference in camera bodies these days too. Film has been replaced by sensors, and these vary in sensitivity and quality, depending on how much you want to spend. The biggest differences come when sensors are pushed towards their limits with low light photography. Better (read: more expensive) sensors and especially full-frame sensors perform much better at high ISOs and are less noisy (grainy) even at low ISOs in low light. Better sensors will also give you much greater dynamic range (ability to capture a wide range of detail in both shadows and highlights). The importance of lens glass can’t be understated though, and while you might find you change camera bodies every few years as sensors continue to improve, a good lens will stand the test of time. For landscape and outdoor photography I find zooms convenient and usually carry a 16–35mm, 24–70mm and 70–200mm. The best upgrade for someone looking to move on from kit lenses is to look at a lens in the 24–70mm, or 24–105mm range (for full-frame). These lenses give a great wide angle and moderate telephoto without compromising image quality with too large a range (huge-range zooms are best avoided). When people refer to ‘fast’ lenses, they’re referring to the maximum aperture that the lens is capable of (eg. f2.8). A faster lens lets in more light, making it more versatile in low-light situations and allowing more creative use with shallow DOF. Better lenses also bring richer colour and tonal depth to your photos, and will operate well at a wide range of focal lengths and apertures.